I only had the night before my flight to paint my nails. I knew I needed something simple to do. So I browsed through my previous nail art designs to get some inspiration. When I came across my blue ombre nail art I did last 2012, I thought I'd reinterpret it. 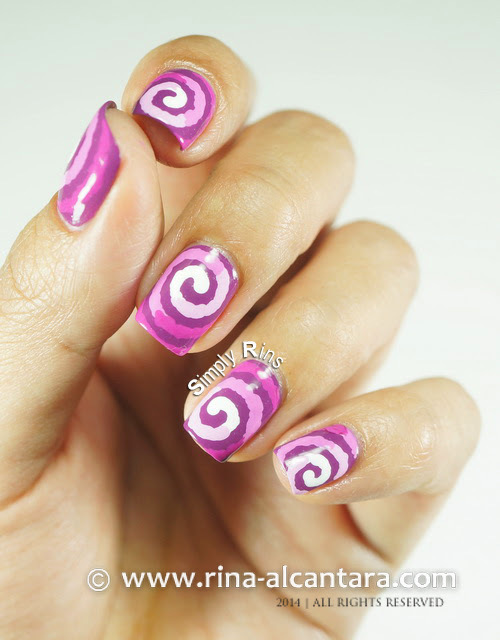 The idea is to create an ombre manicure using the description Pantone defined "Radiant Orchid" and to show how to get a similar effect of the Blue Wave Nail Art Design applying an easier method. I used Dazzle Dry Planet E! in 2 coats as background color and painted this freehand nail art using Liquitex acrylic paints and a dotting tool. I think it's the perfect shade for the design that I aimed for. I only used white and a purple paint for the ombre design. I started with white and just added purple accordingly. Painting curves has always been my weakness. I knew that using a nail art brush would take me more time to finish and I didn't have that luxury. So like my first nail art for 2014, I decided to use a dotting tool to draw the swirls on my nails. It proved to be so much easier, especially while working with my non-dominant hand. You might have noticed that I'm inspired by swirls lately and I am appreciating dotting tools more than before. Sometimes, using nail art brushes can be very challenging. This swirl-y design would probably look good using the rainbow colors. That would probably look really cheerful. I wore this nail art for 10 days! This is the longest time I've ever worn one. And I have to say that I only have minor chipping on a few nails, aside from the obvious nail growth near the cuticle area.